Polish Pottery Tray with Handles. 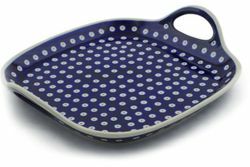 Our Polish pottery serving tray is made of nonporous stoneware that won't absorb odors or flavors. The hand-painted surface is scratch resistant and easy to clean. This is a beautiful piece of Polish pottery, festive enough for entertaining as well as everyday use.